Talk about an epic local weekend for football fans! This one was pretty insane, and it didn't even include a Seahawks game since they dispatched the 49ers on Thursday in a game that looked a lot more like we all expected the Seahawks to look. At the college level, though, it was a weekend for much celebration around the Inland Northwest. The Cougs not only didn't Coug It after taking a big lead, they actually find themselves with a winning streak and a nationally televised came coming up. Eastern Washington rode a record-setting day by all-world receiver Cooper Kupp to a tough road win. And Vandals — yes the Vandals! — won for the second week in a row for the first time in six years! I'm surprised Moscow is still standing. 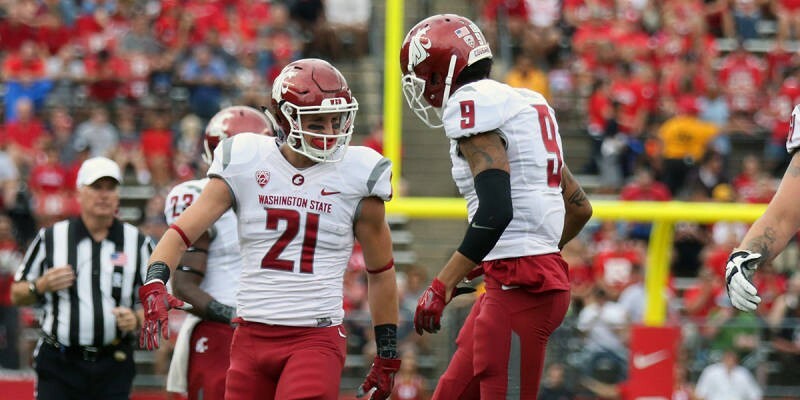 THE WSU COUGARS, A NEW PAC-12 NORTH POWERHOUSE? Okay, that might be a bit much, but how many of us wrote off the Cougars immediately after they lost their home opener to Portland State? I know I did. Now, after outlasting Arizona in a wild road game 45-42, WSU are the proud owners of a three-game Pac-12 winning streak, and a chance to get to the top of the North division if they can beat Stanford at home Halloween night. Quarterback Luke Falk threw for more than 500 yards and for five touchdowns, including four to wide receiver Gabe Marks, who might be setting himself up for a nice pro career if he keeps doing that. Arizona is not exactly known for its defense, but the team was in the Pac-12 championship game last year, and taking them down on the road is impressive. So, where do the Cougars sit in the larger scheme of things? They're 5-2 overall, and just one win from bowl eligibility. In the conference, they're 3-1, with games remaining against Stanford (on ESPN this Saturday at 7:30 pm), Arizona St., UCLA, Colorado and Washington in the Apple Cup. If they can beat Stanford — easily the class of the conference this year — they can beat anyone on the schedule. Suffice to say, there hasn't been a bigger game in Pullman than what's going to happen this Saturday in a long time. No hyperbole there, since these guys are three-time defending champs in the conference and remain undefeated in the Big Sky this year after a thrilling road win at Northern Colorado, winning 43-41 on a last-second field goal by backup kicker Jordan Dascalo. 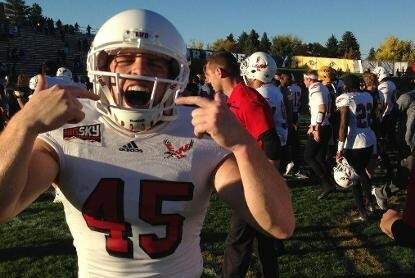 EWU's Dascalo was pretty pumped after making his game-winning kick Saturday. "It was one of those hard-fought games on the road," said Eastern head coach Beau Baldwin after the game. "At different times they felt in control, and then we felt in control up 12. But give them credit — they made plays. Ultimately it took us to go down and make a big field goal by Dascalo. When he hit it there was never a doubt — he drilled it. Give him credit, he hasn't kicked a lot of those. He does in practice, but he hasn't been our field goal kicker. But he keeps getting better and better. He just hasn't kicked much in the past." Good thing the Eags won, because it would have been a real bummer for them to lose on a day Cooper Kupp caught 20 (!) passes for 275 yards and three TDs. He now holds the Big Sky records for most catches and most yards receiving, and it's just ridiculous the numbers he's putting up. What's the win mean? It mostly means Eastern is is great shape going down the stretch, with three of their last four games coming at The Inferno in Cheney, starting Saturday with a noon game against surprising Weber St. (3-1). The game will be televised on ROOT. 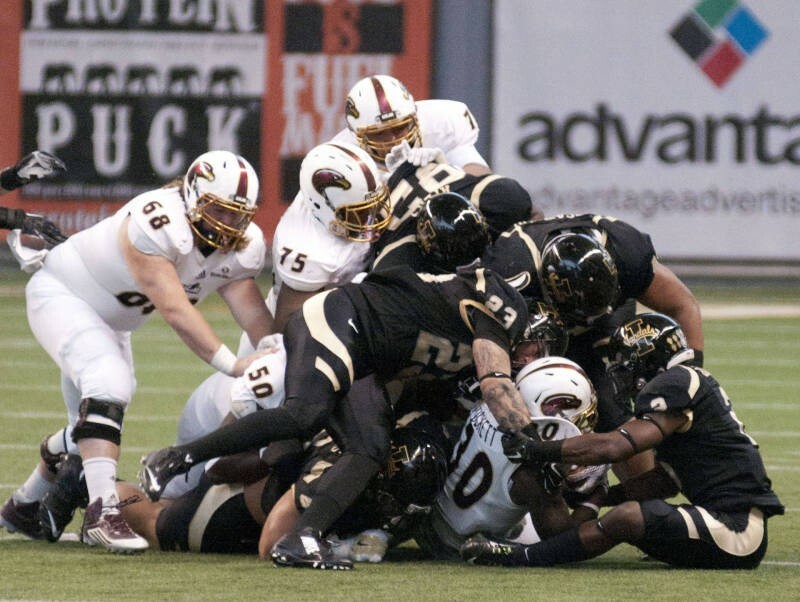 The Vandals aren't going to scare anyone, but their 27-13 win over Louisiana-Monroe Saturday at homecoming was their second straight victory, and the first time they've had back-to-back wins since 2009, when they went on a five-game streak and ended up going to, and winning, the Humanitarian Bowl. Could a similar storyline be in the cards in 2015? They need to win three of their next five games to be bowl eligible, and they have games to play against New Mexico St., South Alabama, Appalachian St., Auburn (yes, Auburn) and Texas St. It won't be easy, but for now it's probably just nice for Vandal fans to look at the Sun Belt standings and see their team in the top half instead of scraping the bottom.